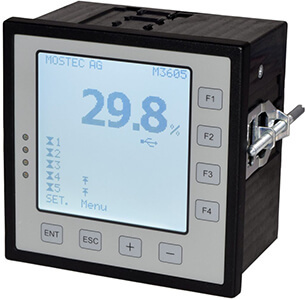 The digital display M3605 is used to indicate or monitor any sensor signal. It converts the input signal to an internal standard signal of for example 0 to 100.0%. In this range five alarm contacts can be set independently. The 4-digit measuring value, as well as the status of the alarm contacts, is shown on an easy to read LCD-Display. All settings as alarm values, hysteresis, range and operating mode of the floating contacts can be set directly by the instruments keyboard. The instrument has an intuitive and easy to use customers menu to set all parameters including the range, signal range and unit of the device. A typical application would be to measure and monitor contents of water in a vessel. The pressure transmitter converts the pressure of 0 to 0.5bar to a current signal of 4 to 20mA. The M3605 monitors five different water levels in the vessel. It converts the 4... 20mA signal current to 0%...100.0%. All five alarm contacts can be set at different water levels between 0% and 100%. With these floating alarm contacts, valves, pumps, alarms etc. are driven directly. The galvanically isolated output signal 0...20mA or 4...20mA can be programmed to any section of the indicated measuring range. The digital display M3605 uses a universal power supply from 20 to 253VAC/DC.